← VALENTINE’S DAY… A Reminder Why Every Day Should Be. Many of us seem to have a bucket list of some sort or another. Myself? I’ve had a few, but the two biggest have been places in the world I have yet to travel to and the other list consists of food I haven’t tried. Some actually cross over to each list, and that’s where this blog comes from. One of the world’s most famous steaks, but more importantly, the place where many swear that it must be eaten. 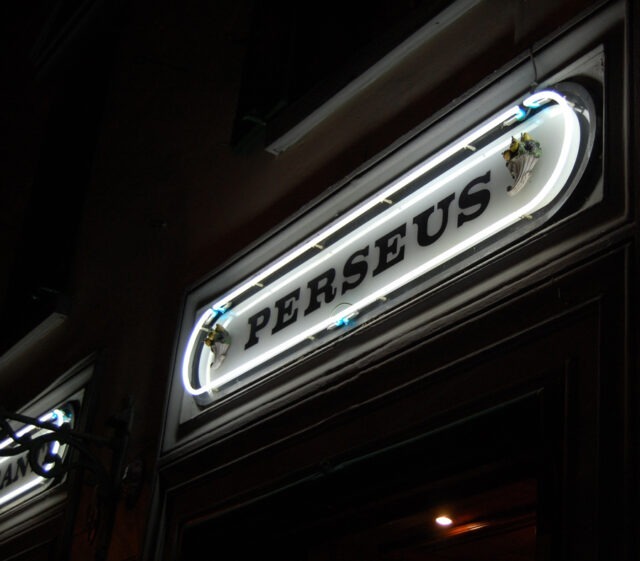 Ristorante Perseus, the entrance lit up at night. (picture courtesy of TripAdvisor). 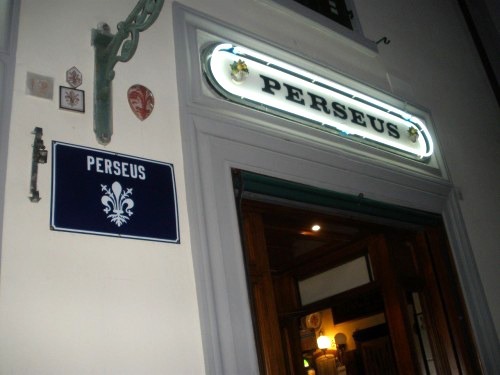 That location is Ristorante Perseus in the city of Florence, Italy. Perseus has always been the go-to place for Florentine’s for Bistecca alla Fiorentina, aka Steak Florentine. Let me actually delve into that steak a bit before I get into Perseus. After all, it’s the legendary steak that brought me to this restaurant. 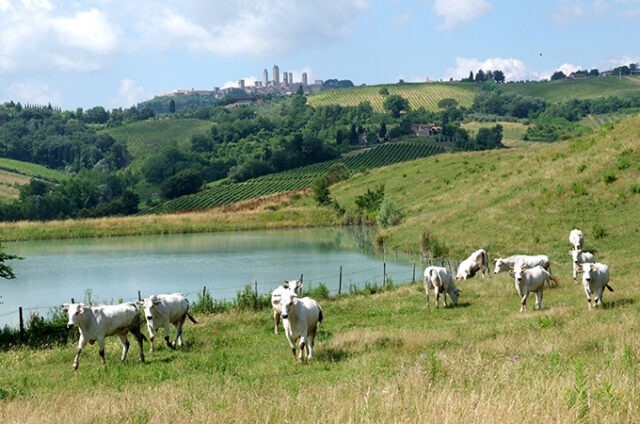 The Chianina cattle roaming the hills of Tuscany. (picture from the internet). Steak Florentine is the famed Tuscan Porterhouse steak, produced from the regions prized cattle, the Chianina breed. Not only one of the oldest breeds of cattle in the world, but one of the largest too. 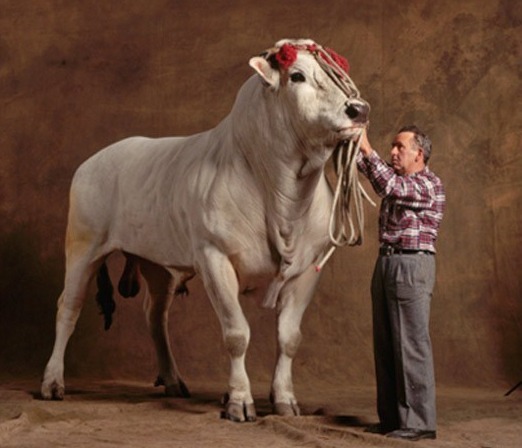 A Chianina bull actually holds the world record weighing in at 3,840 lbs. First mention of this mostly white, majestic breed goes back as far as 55AD, and has been bred throughout the Tuscan, Umbria and Lazio regions. These regions are known to grow the greatest fruits & vegetables and produce some if the worlds most renown wines. It’s no wonder the cattle raised here provides for some of the planet’s most tender and richest beef. A prized Chianina bull. Showing the sheer magnitude of the breed (picture from the internet). That now brings me to Ristorante Perseus. In a city that’s home to one of the worlds greatest steaks, you’re bound to have many choices, and pretty much everywhere you turn, Steak Florentine is being advertised. 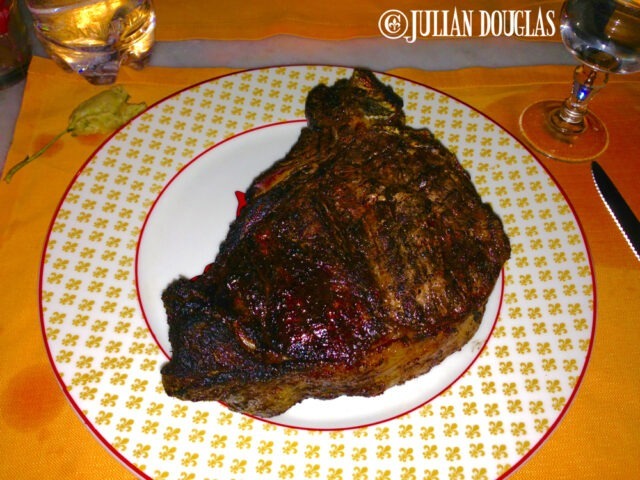 The thing is, most places in Florence will say they serve it, but it’s not always the true Chianina beef. It’s like comparing a real Kobe grade to USDA Prime, dang good, but apples and oranges. After all, if you’ve come this far to finally mark something off your bucket list as I had, you certainly want to make sure you’re getting 100% authentic Bistecca alla Fiorentina!!! The view of their meat case walking into the restaurant. They were just starting to fill it when we arrived, it tripled in size with goodies not long after. Chances are if you are coming to Florence on vacation, you want the experience to be the best it can, and here is where it will be. It was the first place our hotel concierge told us we should go, flat out. It was a top spot in Zagat’s. It was the place all my research pointed out. One thing however I read in many reviews, and also heard from many tourists, is that Perseus was more a locals only place, not kind to outsiders. That the servers would sit tourists all in a back area of the restaurant, were given rude and bad service, or even at times told they had no room. Well I’m here to tell you that’s all false. Completely far from it, at least for our visit. A view deep inside Ristorante Perseus, which goes to show anywhere you sit is a great place (picture courtesy of CasaTrattoria). Perseus was located near the hotel we were staying at in Florence, so any excuse for a short stroll on a nice night through the streets was not a problem and within minutes we were there. We walked in with no reservations, which is a bit of a no-no only because many small places just fill up for the night. Italians don’t eat and leave, meals are meant to be enjoyed, and with their company. On top of that, Perseus was busy, but at least it was an off night. 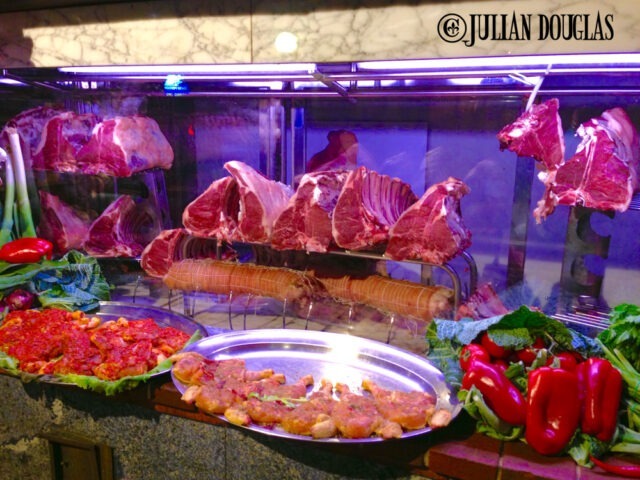 We waited for only a moment, as I drooled looking through their glass, refrigerated display case, showing off some off their prized cuts of meat. 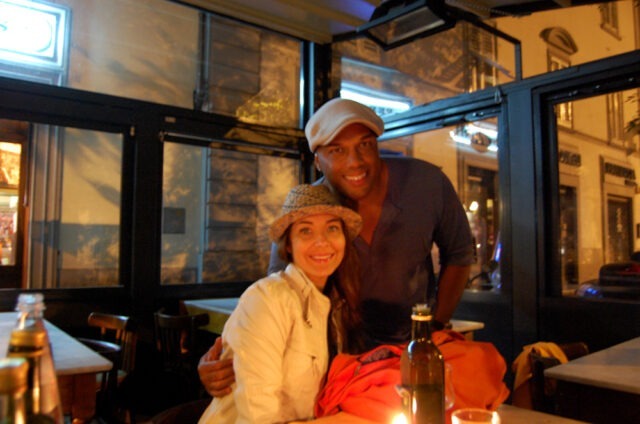 Nicole & I sitting down to enjoy one of our best meals in not only Florence, but on our trip through out Italy. 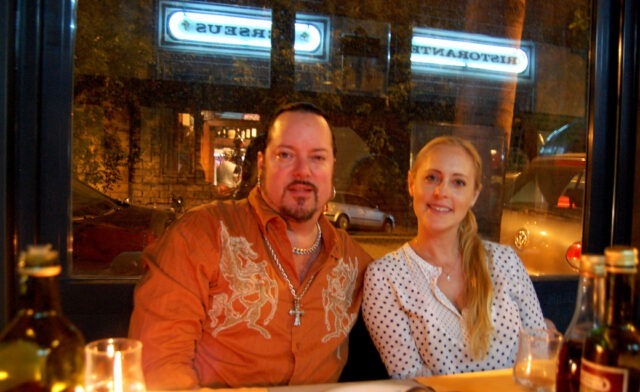 Enjoying the outdoor patio at Ristorante Perseus (picture courtesy of Jennifer B). They then sat us right away on their outdoor area. Which was a front tented patio, adding to the charm of Florence by night. There were two things I was now worried about. Our close friends we were traveling with, Jennifer and Tracy eat their meat well done, and Steak Florentine is never served that way. In fact, Perseus is especially known to refuse to cook theirs any way but rare. Which I’ll get back to why in a bit. The other of course, was to let our server know my wife is not only a vegetarian, but has certain food allergies. Jennifer & Tracy, bringing “amore” to travel and making ordering food just as much a part of the fun.. Let alone showing there’s always room for the big orange bad ant any table, lol (picture courtesy of Jennifer B). We started off with her, and when it came to my wife Nicole, I couldn’t write a better script to say how he couldn’t have made the night any better for her. He basically told her he completely understood and he would take great care of her, all with the most amazing smile, this big jolly Italian, meat-loving man just giggling with my little American vegetarian wife. I knew it would be great, but what I didn’t know is how our server would keep bringing out vegetarian dishes for my wife to try, not even charging for most of them, samples of this and that the whole night. 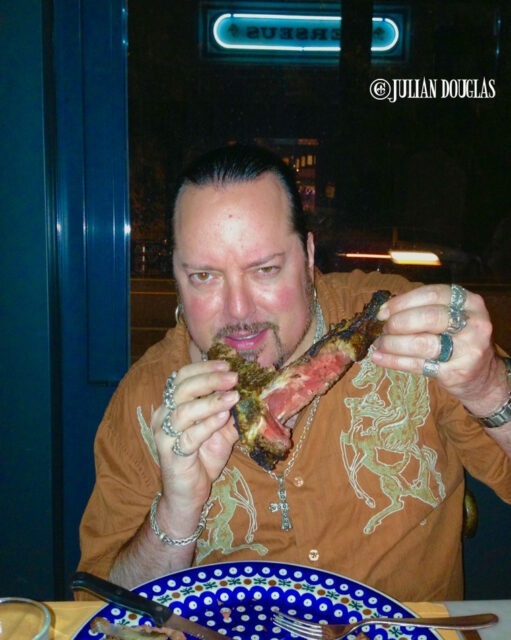 Well for me, because, this is really all about me, lol, and I was at Ristorante Perseus, I took one look at him and just said the special… yes, Bistecca alla Fiorentina. He did ask if I was sharing with Jenn & Tracy, which I said, NO, this was all for me. He laughed. Now they did ask next about the steak for themselves, and ordering it well done, and to no avail. Don’t get me wrong, there are many places that will prepare it that way, but the cuts that Perseus have are so thick, so mammoth in size, and are seared on such a high flame that for them to remain on the grill long enough to cook through, the outside will just char way too much. At the same time, it’s just as taboo to cut into the meat early to cut it up to cook it as that would let those precious juices escape. That is why they won’t break from their tradition. Not being ride, not being assholes, and some tourists wrote reviews not understanding that. Rookie meat eaters, lol. Luckily they have many other cuts of beef along with other meats, and non-meat items too. So Jenn and Tracy ordered some great steaks, cooked to their liking. 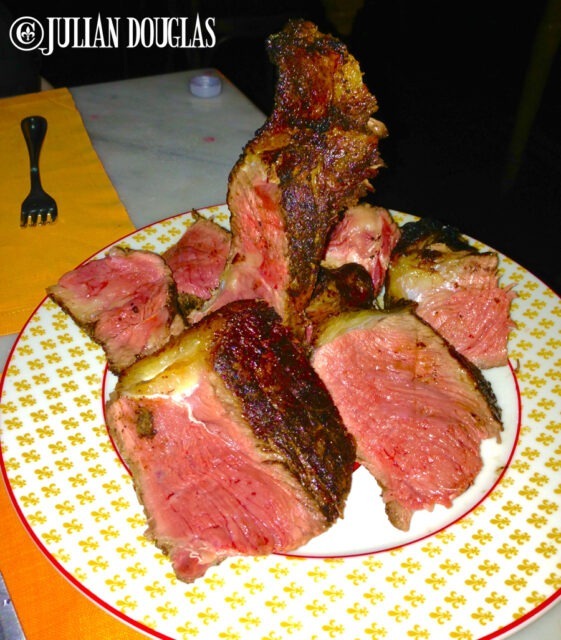 All hail the 35 ounces of Chianina beef… Bistecca alla Fiorentina !!! We sat around for a bit, soaking up the Florence nightlife passing us by outside, enjoying some wine he brought out for us and in no time at all our meals came. Especially mine, my 35 ounce behemoth. In an artistic, skilled motion, he carved it up into portions displayed for any steak lover. Each piece of the huge Porterhouse for ones desire… sections of what Americans would call New York cuts and glistening filets. It was a taste sensation like no other for any carnivore. Cooked perfectly as Bistecca should be, rare-medium rare. The flavor, everything it was talked up to be. I can honestly say, those first bites, steaming hot, juice running down the side of my mouth… sorry, but it was that great then and still the thought lingers now. It was, hands down, one of the top three steaks I have ever eaten in my life, and that says something. Our server in a matter of a minute or two strategically sliced up monstrosity into small individual steaks. Jenn and Tracy‘s steaks, they were great from everything they said, not one complaint. Let alone the most amazing deserts for us. The service, I can’t say enough about. Amore for all four of us. By the way, I do have a small confession. I didn’t finish the whole steak. Could I have? I don’t think I could have and I have polished off up to a 36 ounce prime rib once or twice before. But never one this rich, this tender, this sweet. To be honest, it would have been a crime to try to. It was too nice to savor. But the great thing was I was able to take the leftovers and the next morning I gave it to Tracy who had our hotel chef at breakfast heat it up for a special steak & eggs meal to start our day, not bad huh? Hmmm… #BadToTheBone, I couldn’t resist that one, lol. This was the moment of sheer carnivore delight, plain & simple. I will be thankful to Perseus for adding to what Florence had to offer. I’m thankful that I listened to our hotel concierge. I’m thankful I listened to my gut and not to some of the reviews I had read, but then I don’t always trust certain “tourists” compared to “travelers”. More importantly I’m thankful to the staff and especially our server, who I wish I could remember his name, at Perseus who showed what makes them shine in the City of Florence, to the locals that call the city their home, or to those that are lucky enough to visit. Ristorante Perseus, Firenze, Italia at night (picture from the internet). It’s a short piece but fantastic. I believe it features our server too. Funnier yet was how they explain about preparing the Steak Florentine only rare. Needless to say I had Jenn and Tracy watch it. Still shot from Andrew Zimmern’s stop at Ristorante Perseus on Delicious Destinations – Florence (picture courtesy of Travel Channel).